One of my absolute favourite ways to eat this fuchsia root vegetable is raw, sliced in half and then dipped in equal mix of salt and red chilli powder. The radish delivers a crisp and crunchy burst of peppery mist, enhanced further by the salty-chilli flavours. 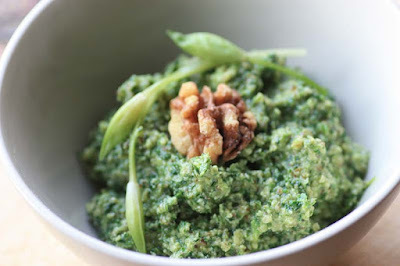 Another one of my favourite radish recipe is a South Asian curry known as Mooli Methi Salan (Radish Fenugreek Curry). Mooli Methi curry is traditionally made with fresh with fresh fenugreek. Fenugreek is an acquired taste, I really like it and am actually growing some in the garden. Its really hard to describe the flavour of fenugreek, its pungent and has bitter undertones. Anyway, I would have made this spicy curry dish, but I wanted something a little lighter, yet comforting and ended up making a savoury rice. In place of the fresh fenugreek I’ve used dried fenugreek also known as kasoori; kesuri methi. You can find dried fenugreek, (as well as cassia bark and black cardamon) at most South Asian grocers, and even in some of the larger supermarkets, but if you can't find any you can substitute it with another green leaf, though the flavour won't be the same. 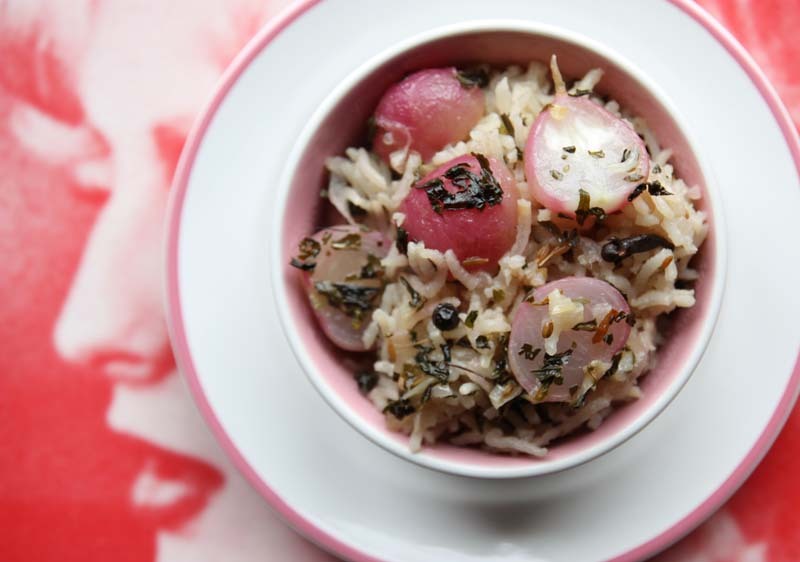 This savoury Radish and Fenugreek rice dish turned out to be quite flavourful. I had under estimated the heat of the fresh green chilli finding the seeds a little intense, so you may want to use only one, rather than two as well as remove the fiery seeds. When my mother cooked savoury Pilau rice dish, she would just *throw in all the whole spices into the pot to infuse the rice. It was quite normal for us to be pushing the cassia bark to the side of the plate; or picking out the cloves and peppercorns, so the appearance of these inedible whole spices don’t bother me. However, I understand not everyone is like me and may find them unsightly, even off putting. So with the exception of the coriander and cumin seeds, you may wish to tie the spices in a muslin cloth whilst cooking. Heat oil in a pan with a tight fitting lid. Add the onion and all the spices and cook until the the onion is meltingly soft. Stir in the rice and the fenugreek leaves, dry fry for a couple of minutes, before pouring in the water. 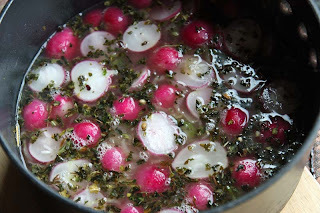 Bring to the boil, turn the heat down and add in the radishes, do not stir in as they will overcook. Put the lid on and cook on low heat for 25 – 30 minutes. Stir rice and radishes well, before serving. If you wish, serve with natural yogurt or soured cream. I'm interested that you grow fenugreek - is it easy to grow? Lovely lovely rice dish! I never thought of cooking rice with radish! Thanks for sharing! Perfect timing for this dish, with the radishes coming on strong from the garden. They are such a versatile vegetable, aren't they. I wouldn't mind the Cassia bark or cumin and like you, would just push them aside. We recently tried a great spouting mix "Egyptian" and some of the seeds were fenugreek...what wonderful flavor! Oooooh, I'm growing fenugreek leaf (which In that Iranian green herb dish) and radish (although they are being gobbled up fast - note to self remember to sow successionally) and I have some mooli seed (free with a mag). Thanks for the recipe. Oooh YUM! Looks and sounds great and I have tons of fresh radishes coming out of the ground at the moment. I grow fenugreek - very easy indeed, and so good fresh. Definitely trying this dish with the black cardamom. Would you believe I've never had radish? This might just inspire me to try it! Wow, what a lovely looking dish! I love cooked radish, I don't think enough people cook with it. I'll have to give this a try now my little multicoloured rows of radishes are ready for harvesting. Is fenugreek easy to grow? I've never tried it, though I do love its pungent & unmistakable aroma. 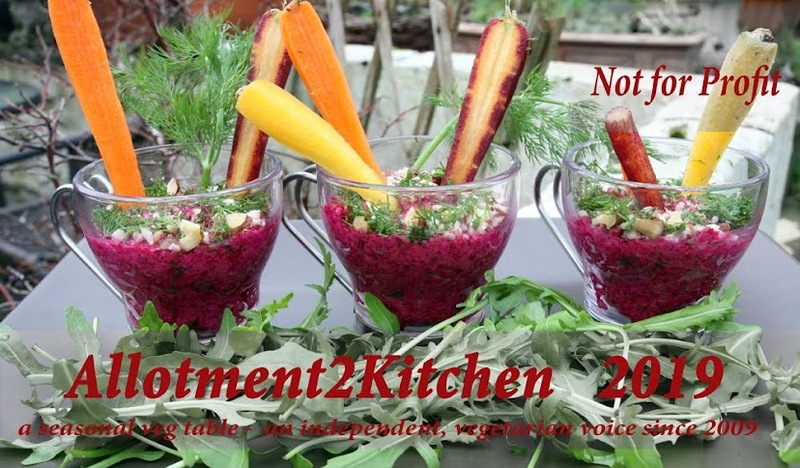 I am a big fan of all vegetables so I welcome this healthy recipe! Looks great. Is everything allright with you? You are such a reliable blogger that one can't help but worry when there are more than two bloggin free days. I have so many Japanese radish (daikon) growing in our small garden at the moment. I wonder if I can use this recipe for the daikon as well. I think its easier than growing sunflowers. Just scatter evenly onto the earth and cover lightly, sprinkle with water and about 2 weeks later you will see it sprouting. Try it in pots first and see how you find it. Thank you Food Glorious Food. Its my first time cooking radishes with rice and I thought it was fine. It may not be to everyones taste, but I recommend it. It was certainly very aromatic. I have to agree with you and say Yeph radishes are very versatile. I'm pleased to read that you wouldn't mind the Cassia bark on your plate and like me would just push them aside. I like the sound of your Egypian spouting mix - may I ask other than fenugreek what else was in there as I would like to have a go at recreating it at home one-day. Ihave a sprouter and hardly ever use it. Its been rain, rain, rain and today the winds are 70mph. We are expecting to see some fallen trees here. Its good to read that your growing fenugreek leaf and cooking tasty dishes. Even better when they are being gobbled up fast. Yes, you must make a note to yourself to remember to sow successionally. My mother is growing some white daikon aka mooli. She normally grows in straight in the ground, but this time decided to grow it in large pots - I'm not too sure if they will bulk up as much, so I'm quite curious to see the outcome. I hope to report on her experiment as my intentions are to visit the family in Wales and eat some of her Mooli-Methi Salan. I think everyone should grow fenugreek - as you said its very easy indeed, and so good fresh - but it is an acquired taste, some people find the smell and flavour pungent - I love it. Black cardamon does infuse both flavour and aroma. 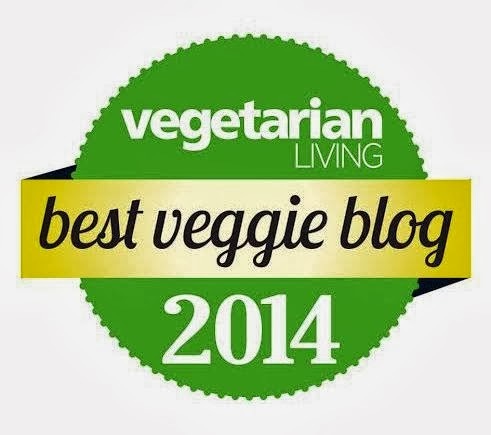 I'm so pleased to read that my blog post may have/has inspired you to try it! I have used a tea infuser in the past in pilau style dishes and have always found that the infuser imparts a metallic tastes. Your right to point out that not many people cook with radish. 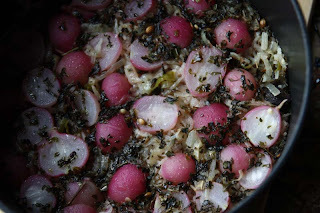 If you do get round to making it, Please do post your version of this dish using your multi coloured radishes. I'm growing soem rainbow radishes as I have seeds left over from last year and hope to be harvesting them in a couple of weeks time. Yes fenugreek is really easy to grow. TRy some in the corner of your plot or in a pot. Sow as you woudl lettuces and then cover with soil gently and sprinkle with a little water. It should have germinated within two weeks. I'd encourage sowing successionally. This one has been created by me as I've never seen radishes in a rice dish before, but the South Asian curry dish Methi-Mooli is one I've eaten since a child. If you do give this a go, please let me know how you find it. I hope you like the radishes cooked, they do taste slightly different. Like you I too am dreaming of a herb and vegetable garden in my 'own backyard' - we can only work to make that dream come true. Lets hope together that we get a little piece of earth that we can 'really call our own'. Oh Thank you so much for your concern and noting my absence. I've been away from my home turf and computer as I've been down in Essex to see my mother in law (who was widowed late last year). My husband made an impromptu decision to travel down, so I wasn't really able to let my readers know. Thank you for your warm words though, its really appreciated knowing my blogging is being missed. 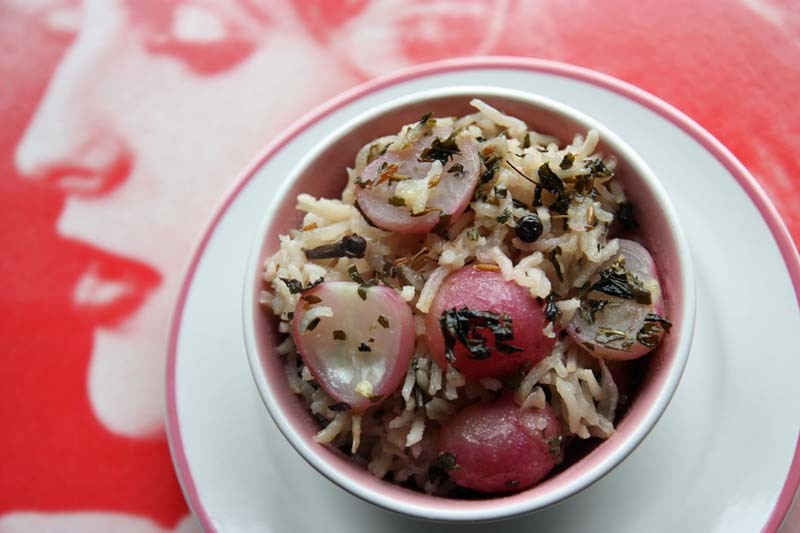 I know the daikon would work wonderfully in the South Asian curry dish Methi-Mooli as my mother has often made it this way, but as to this rice dish, mmmm I'd say yes it would work, just peel the skin and chop into even size chunks. Please do Let me know if you think it works out well? i love radishes because you can use the whole plant, from top to toe(: it's a beautiful vegetable! Thank you so much for your comment Shu Han. My mother tends to use the whole radish in recipes, I just keep forgetting to do so - maybe my next radish recipe will include it. I'm Coming on right over to check your recipe link.